Why in the world did the Times think that the very best person to write about whether algorithms should be used to decide when to investigate child abuse allegations against poor families of color is a white, middle-class foster parent? UPDATE, JANUARY 16: Everything the Times Magazine story got wrong, this story, from Wired, got right. The author looked at the same predictive analytics model in the same county that was the subject of the Times story. The article is an exceprt from a great new book, Automating Inequality: How High-Tech Tools Profile, Police, and Punish the Poor. Will you have enough to eat? Depends on whether we let you keep your minimum-wage job after you took a day off to care for your sick child. Will you have a decent place to live? Depends on whether we’ll accept your “Section 8” voucher – if you even have a Section 8 voucher. Will your illness be treated? Depends on whether we decide you’re eligible for Medicaid. Will you make it home without being stopped and frisked – or worse – for no reason? That depends on our police and how we trained them. And because practitioners of journalism remain overwhelmingly white and almost exclusively middle class, we even get to decide how your story is told. But I haven’t seen the same understanding when it comes to controlling narratives about race and class. But so far this year things aren’t going as well at the Times. 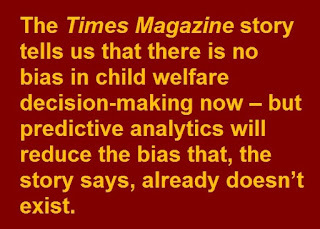 This month the New York Times Magazine published a story about whether it’s a good idea to use “predictive analytics” – computer algorithms – to decide which families should be, at a minimum, investigated as alleged child abusers. The families are overwhelmingly poor and disproportionately African American and Native American. There is no shortage of good freelance writers out there. So when the Times Magazine decided to assign a story, or accept a proposal submitted to them on this topic, why in the world did they think that the best person to do it would be science journalist who also is a white, middle-class foster parent? Yes, there are some white middle class foster parents who get how the system really works and fight to change it. They understand how often poverty is confused with neglect, for example. One such foster parent helped change an entire child welfare system. Other foster parents make heroic efforts to reunite families. Often, however, the attitudes of foster parents range from genteel condescension – “We really want to help these birth parents because we understand they’re sick” – to barely-disguised, or undisguised, hatred. No, this does not mean that foster parents shouldn’t be allowed to write about their own experiences and about the child welfare system. 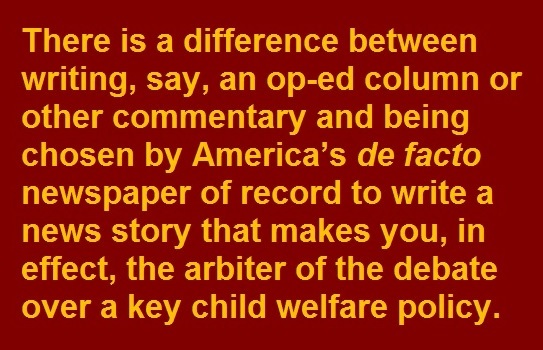 But there is a difference between writing, say, an op-ed column or other commentary and being chosen by America’s de facto newspaper of record to write a news story that makes you, in effect, the arbiter of the debate over a key child welfare policy. So at a bare minimum, if you’re going to entrust a story about impoverished people of color who are suspected child abusers to a white, middle-class foster parent, such as Dan Hurley, who wrote the Times Magazine story, editors should be extra vigilant about bias. They should do an extra level of fact checking, not only concerning what’s in the story, but what is left out. The Times did none of that. The result is a whitewash – in every sense of the term. 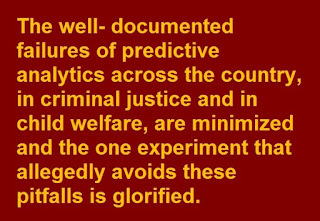 The well-documented failures of predictive analytics across the country, in criminal justice and in child welfare, are minimized and the one experiment that allegedly avoids these pitfalls is glorified. Hurley’s take on racial bias in child welfare in general is rife with contradictions. For starters, he shows deep sympathy for the “denial caucus” – that bizarre group within the child welfare field that believes they are so much better than everyone else that their field is magically exempt from the racial bias that permeates every other aspect of American life. So he cites only research that purports to find that bias is not a factor in the disproportionate rate at which families of color are investigated and their children are removed. He ignores the huge body of research that shows racial bias is indeed a crucial factor. Hurley does quote people who acknowledge that yes, the underlying data in predictive analytics algorithms are biased. But then he goes on to claim the way the algorithms are used actually reduces bias in child welfare decision making. 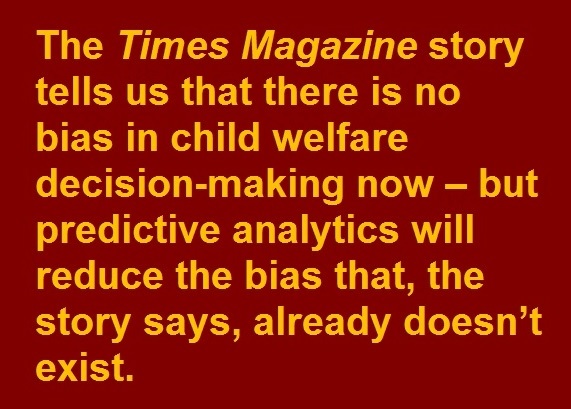 In other words, the Times Magazine story tells us that there is no bias in child welfare decision-making now – but predictive analytics will reduce the bias that, the story says, already doesn’t exist. 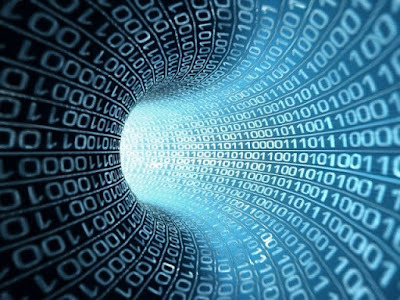 when it comes to criminal justice, where analytics are now entrenched as a tool for judges and parole boards, even larger complaints have arisen about the secrecy surrounding the workings of the algorithms themselves — most of which are developed, marketed and closely guarded by private firms. But that’s all he says. He ignores the much bigger problem: Racism. The formula was particularly likely to falsely flag black defendants as future criminals, wrongly labeling them this way at almost twice the rate as white defendants. White defendants were mislabeled as low risk more often than black defendants. But you’d never know that from Hurley’s story. Very few places have actually reached the testing and implementation stage. But two of them already have proven to be failures. In Los Angeles, the first experiment was abandoned during the testing phase after the algorithm produced a “false positive” rate of 95 percent. That is, 95 percent of the time, when the algorithm predicted something terrible would happen to a child – it didn’t. 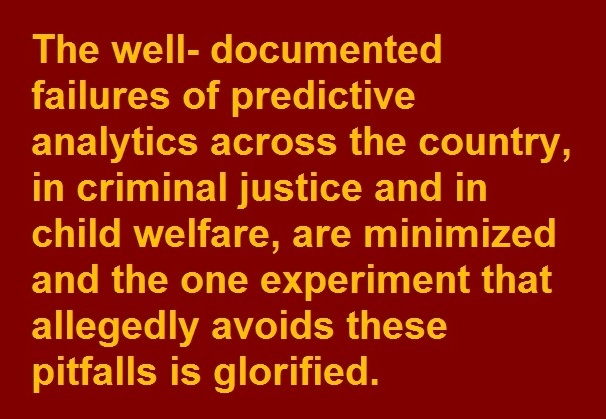 And in Illinois a program marketed by one of the most popular companies in the child welfare predictive analytics field failed spectacularly. Hurley minimizes the Illinois failure and doesn’t mention Los Angeles at all – even though these places took the approach Hurley acknowledges is the norm, hiring a private company with a secret algorithm. While minimizing Illinois and ignoring Los Angeles, Hurley builds his whole story around Pittsburgh, the one place in the country where predictive analytics is least likely to fail – for the moment. The system in Pittsburgh, and surrounding Allegheny County, has been run for 22 years by Marc Cherna. I happen to know Cherna. While I was teaching journalism in the Pittsburgh area I served on the screening committee that unanimously recommended him to run the county child welfare system. He now runs the entire human services agency. We were right. He turned around a failing system and significantly reduced needless foster care through innovations such as placing housing counselors in every child welfare office so children weren’t taken away for lack of a decent place to live. When removal from the home really is necessary, Cherna pioneered the use of kinship care, placing children with extended family instead of strangers. Most recently, while most of the rest of Pennsylvania has gone through a foster-care panic as a result of the state’s response to the Jerry Sandusky scandal, Pittsburgh has not. Cherna has tried to avoid the usual pittfalls of predictive analytics. Instead of a for-profit company with a secret algorithm – which, again, Hurley admits is the norm - Allegheny County opted to develop its own algorithm in the open. Everybody knows what goes into it, [UPDATE: though, crucially, we don't know the weight of each factor] and community leaders were consulted. And I believe Cherna when he talks about all the checks and balances built into the algorithm and how it’s used, such as limiting its use to the initial decision whether or not to investigate an allegation. But there’s a bigger problem. Even Marc Cherna won’t be running a child welfare system forever. What happens after he leaves? In particular, what will follow after this happens: A caseworker leaves a child in his own home and the child dies. The caseworker says “Oh, if only I’d known what the algorithm predicted, but only screeners get to see the data.” That’s when the abuses, and the massive needless removal of children, will start. The selection bias is compounded by the one and only case example Hurley uses – a case in which a human screener would have said “Don’t pursue this report,” the algorithm disagreed and, lo and behold, the case really was high risk! At a minimum, there could have been two stories – that one and a case in which the algorithm said the case was high risk, but it wasn’t, and a family was traumatized for nothing. 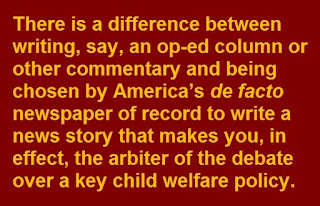 But that wouldn’t fit the “master narrative” – to use former St. Louis Post-Dispatch editor William Woo’s great term - of the white middle-class foster parent who wrote the story - or that of his editors at the Times. Instead, what we get is the mirror image of most stories about birth parents who lose children to the system. Those stories almost always focus on the worst of the worst – the tiny fraction of parents who torture and kill their children - instead of the norm. But when the time comes to tout something the white middle class likes, the selection works in reverse: We get what is said to be the best of the best. That is equally unrepresentative. At a minimum the editors at the Times should have asked one crucial question. It’s the kind of question I was taught to ask by my father when I was in seventh grade.